A swarm of desert locusts laying eggs in provinces of Mauritania has triggered fears of a major invasion at the peak of the harvesting season. Locusts were first spotted at Inchiri, a remote province of Mauritania, in the first week of October. According to the National Locust Centre of Mauritania, the locusts are currently in the mating stage and hatching of their eggs is expected shortly. According to the Food and Agriculture Organization, the situation is now under control. 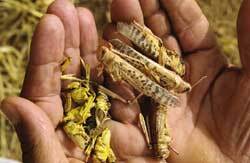 A small swarm of locusts can eat as much food in a day as 2,500 people.